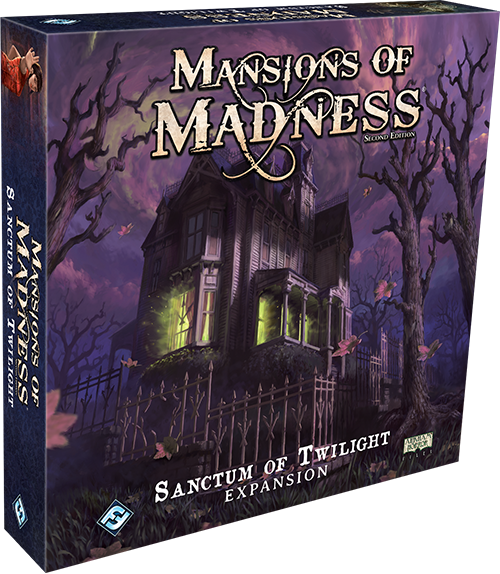 In the Sanctum of Twilight expansion, strange happenings harass the citizens of Arkham in the lead-up to the Twilight Fair. But unlike your previous investigations, where dangers sprung from beyond the reaches of reality, this time the threat arises from within the city itself. All signs point to the Order of the Silver Twilight, but its members’ power and far-reaching influence make them a risky subject, as you may discover in two new digital scenarios. Only the bravest or most foolhardy of Arkham’s investigators would even attempt such a feat. Luckily for the citizens of Arkham, one whom they have chosen to trust with their safety will not abandon them, and another ally has traveled halfway across the globe to ensure the world is protected from threats that defy explanation. 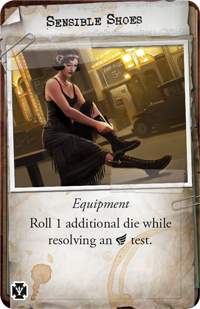 Today, we're introducing Charlie Kane and Lily Chen, the two new investigators from the Sanctum of Twilight expansion for Mansions of Madness. You can pre-order your copy of Sanctum of Twilight at your local retailer or online through our website here! 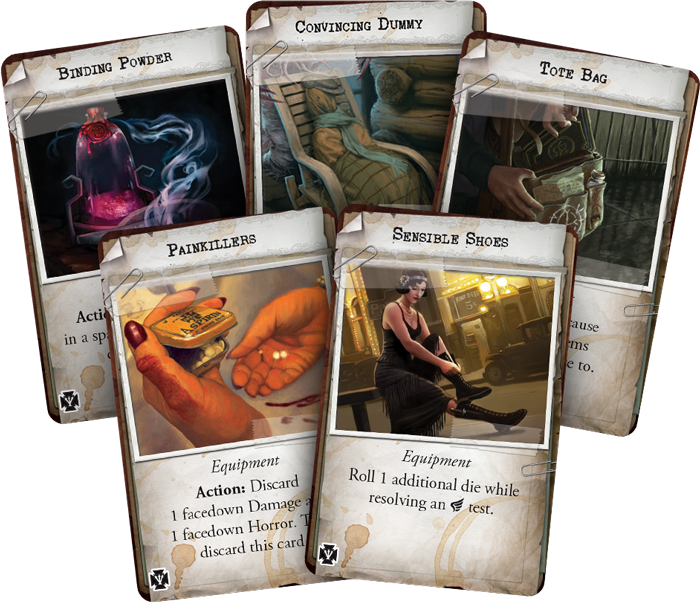 In our last preview, we took a look at the first of two digital scenarios in Sanctum of Twilight: Twilight Diadem. Here, Miss Mary Ann Chase told you that the Twilight Fair and the hosting Order of the Silver Twilight are not all that they appear. Now that your suspicions have been raised, you can't turn your back on Mary Ann and the rest of Arkham, no matter how powerful the Order may be. But if you wish to expose them, you will need help, and one investigator uniquely qualified to take on the Order is politician Charlie Kane. Charlie Kane’s campaign was built on casting him as a man who was willing to take on the most important issues facing Arkham. Between his legion of political allies and his healthy amount of personal funds, Charlie felt uniquely qualified to handle anything that the position of an elected official brought his way. Monsters, cults, and strange rituals were the last thing on his mind, but he now knows that the most important issue facing the people of Arkham is the supernatural forces at work in his city. His time working as a civil servant of Arkham has exposed Charlie Kane to many of the maddening horrors that lurk just beneath the city’s surface. This long experience has opened his mind to unearthly possibilities that could drive others mad, giving him a sanity of nine. The trials of his life to this point, though, have worn him down physically and left with a health of five. As a savvy politician, Charlie also has an incredible ability to persuade others, equipping him with an Influence skill of five. 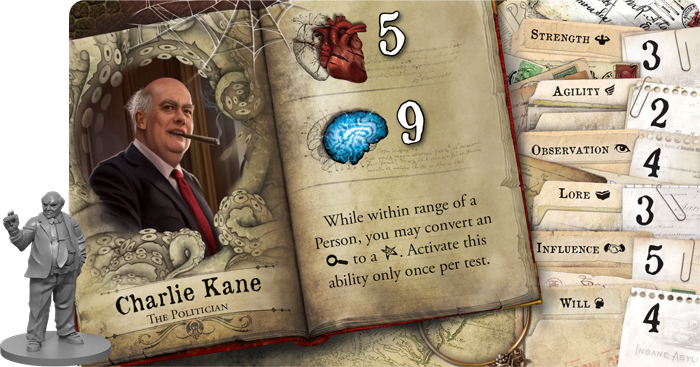 Beyond this, Charlie can also use his charisma to convince others to aid his cause—once per test, Charlie Kane can convert one of his investigation results to a success, so long as he's within range of a person. While he is no longer a young man, Charlie has a powerful will and a skilled eye, trained to notice minute details that others might miss. Few investigators could be more different than Charlie Kane and Lily Chen, yet both have joined forces to battle the evils facing Arkham. As an infant, Lily Chen was given a great and terrible gift: a destiny. An obscure sect of monks in her home country believed she was born to one day face a great evil, and she has trained her whole life in preparation for this fate. Her movements are swift and deadly, and her mind is filled with the wisdom of all who came before her. Though she rarely speaks, her actions prove that she is a stalwart defender against the unimaginable terrors that lurk on the fringes of reality. Now, she searches for unique and ever more difficult challenges to hone her skills, as she awaits the day when her destiny will be fulfilled. Steady in both body and mind, Lily Chen has both a health and sanity of seven. Though she is unafraid to use a weapon when one proves useful, Lily is a master of unarmed combat. As such, her special ability states that any time she is attacking unarmed, a monster that would suffer at least one damage suffers two additional damage. 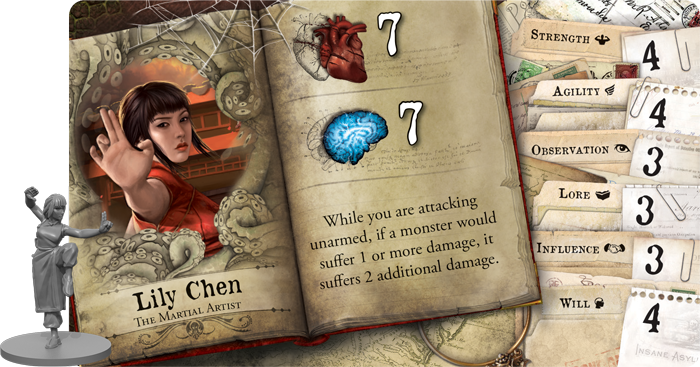 Whether they're cultists, wraiths, or monsters drawn from the edges of reality, nothing can stand against Miss Chen’s practiced, precise strikes. In every skill area, even beyond those of combat, Lily has trained to maintain balance. The monks who raised her taught her well, but will Lily be ready to face her destiny when the fateful day arrives? 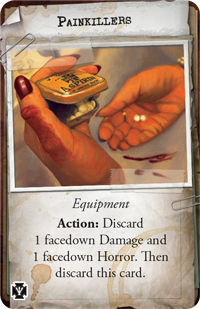 To bring further balance and strength to your investigators, Sanctum of Twilight also introduces a new collection of item cards that you may add to your arsenal during your investigations. Charlie Kane may find himself feeling more agile simply by switching out his uncomfortable loafers for more Sensible Shoes , while Lily Chen may find the will to continue her fight against the Order by taking a few Painkillers . Combined with new spells and equipment, these items prepare your investigators to confront the Order of the Silver Twilight and expose them before their treacherous plans come to fruition. There's no telling what terrors may befall Arkham if they fail. With the Twilight Fair fast approaching, time is running out to unravel the dark web of deceit that overwhelms Arkham. 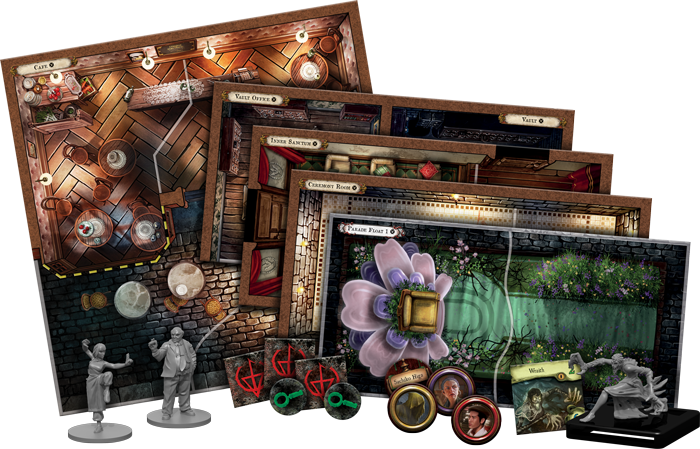 Unite your investigators, protect the citizens of Arkham, and uncover the secrets of the Order of the Silver Twilight! Pre-order Sanctum of Twilight (MAD26) from your local retailer today or on the Fantasy Flight Games website here!